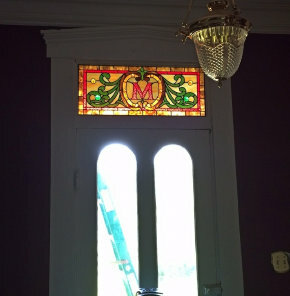 Cliff called me about building a stained glass transom for his 1860 home in southern Indiana. He wanted an ornate Victorian style transom similar to one on my transom design page (pictured to the right). 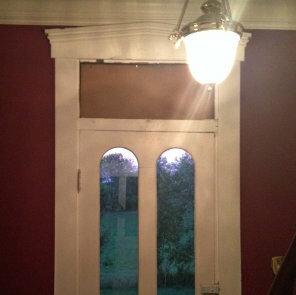 I found the transom photo years ago on the website that stated this transom was from Pittsburg and was built around 1890. 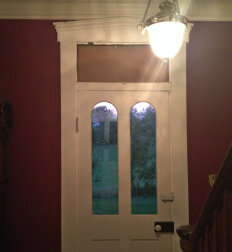 It is a classic example of an American Victorian ornate jeweled transom of the period. Cliff sent a picture of his front door from the inside (on the right). 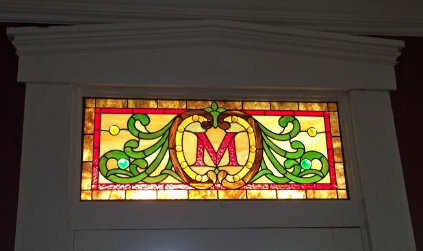 He wanted to try to stay with the feeling of the above transom design, but add an "M" as a central element. I found a period style letter "M" that Cliff liked, and re-drew the transom to accomodate Cliff's dimensions and color choices. Except for a few minor "upgrades" we tried to stay true to most of colors of the original transom. After installation, Cliff sent some awesome pictures showing his new transom. Above, a closeup shows the bold colors of his transom in sunlight ......and Cliff's excellent installation job. On the right, a striking before and after installation comparison of Cliffs new transom. Meyer Transom contains 175 pieces of glass including 19 jewels and was completed in August of 2014. It measures about 14" x 34" and now graces the entrance to Cliff's 1860 home in southern Indiana.